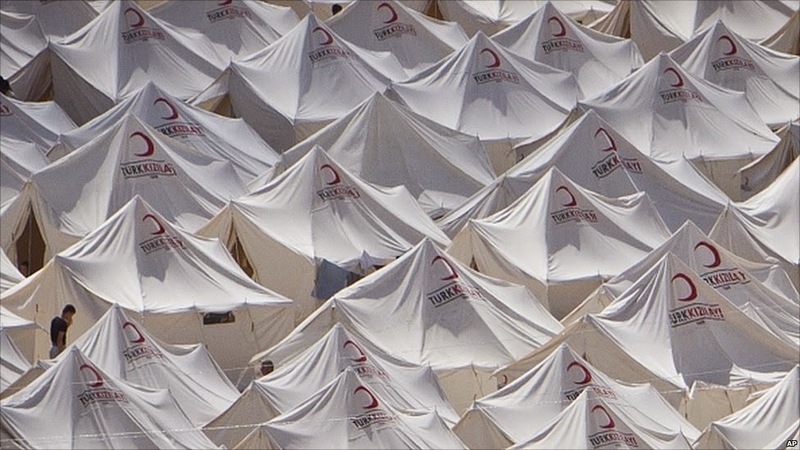 A Syrian refugee walks in the tent compound in Boynuyogun, Turkey, near the Syrian border. Since 2011, over four million people have fled Syria, 3.9 million of them to countries in the region. Last year the British government resettled just 143 vulnerable Syrian refugees from the region to the UK. 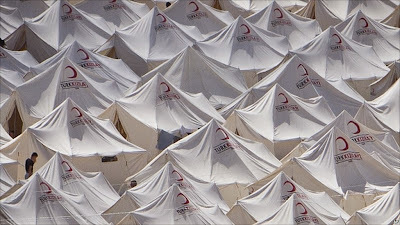 There are over 1.7 million refugees in Turkey. By comparison, in the first four years of Syria’s revolution, just over 5,000 Syrians were able to reach the UK to apply for asylum here: 355 in 2011, 992 in 2012, 1,648 in 2013, 2,081 in 2014. In London, on Sunday 7 June, Syrians and their friends will be saying thank you to the people of Turkey for the solidarity and support they have shown to Syrians fleeing the violence and oppression of the Assad regime and ISIS. Many more Syrian civilians are still in danger inside Syria. The greatest threat to civilians comes from the Assad regime, and its targeting of civilian areas with barrel bombs. According to VDC Syria figures, over half the number of women and children confirmed killed so far this year were killed by regime air attacks. We call on Turkey to do everything in its power to support the enforcement of a No-Fly Zone – across all of Syria – to protect civilians from the Assad regime’s air attacks. Sunday 7 June 3:00pm, Embassy of Turkey, 43 Belgrave Square, SW1 London.